EXTREME SPOILERS BONZA! Dark Water, the aftermath! Holy mother of Gallifrey! This one is only going to be short but HELL! I mean literally. Join me on a review of Mark Gatiss' new episode for doctor who: Robot Of Sherwood! There will be arrows, robots and an evil sheriff. What could go wrong. First off, not bad. I really did like this episode. It was a nice historical story asking the question what is fact and what is fiction. Mark Gatiss has written some of my most favourite episodes, Cold War, The victory of the daleks... etc. This episode features a great cast like Tom Riley and Ben Miller. This is definitely the 'light-hearted' episode and isn't as dark as the new series was made out to be. A good, family friendly episode. But the title isn't good. Boo hoo. 'Robot Of Sherwood' is actually a pun of 'Robin Of Sherwood', a phrase I have never heard before but okay. Lets move on. Of course this is a Robin Hood adventure, so it would be stupid not to put robin hood actually in it. And he is. As I mentioned before, Tom Riley plays the character. I really do like tom riley as the prince of thieves because he plays it with mystery and enthusiasm. Well done Tom! And Ben Miller also makes an appearance as the Sheriff of Nottingham. Once again, fantastic character with a great actor! I have to give a shout out to the merry men even though they didn't really appear in it that much. I also think the robots are brilliant although it would be nice if they had a name other than just robot. Peter Capaldi was excellent once again as the doctor, I think his 'less user friendly' interface was well used as comedy with robin hood. I really love the relationship between the two. A good use of comedy. Well done! My favourite scene was almost certainly the cell scenes between robin and the doctor. Brilliant. I also really loved the direction and camera works, were as in deep breath they were just brilliant and in into the Dalek they weren't as good but this time I really noticed it. I was also pleasantly surprised at the brief nod to Patrick Troughten. You probably have no idea what I am talking about. He played Robin Hood once, and a photo of him in the costume is displayed when the doctor is looking at the robot ship. So yeah, that was nice. But overall, writing = fantastic, directing = fantastic, camera works = fantastic, etc. Do I need to continue. I loved everything about this episode, a nice breather before we get hit hard in the stomach by the incredibly scary looking next episode 'listen'. Take a look, IF YOU DARE! I really did enjoy this episode. Easy to watch without having to keep focused at every moment or else you will miss something vital *hint hint, Ghost light, hint hint* If you liked this episode remember you can catch it again on BBC iplayer along with Doctor Who Extra! Thanks for reading, see you next time for listen! "There are some corners of the universe that have met the most terrible things... they must be fought!" 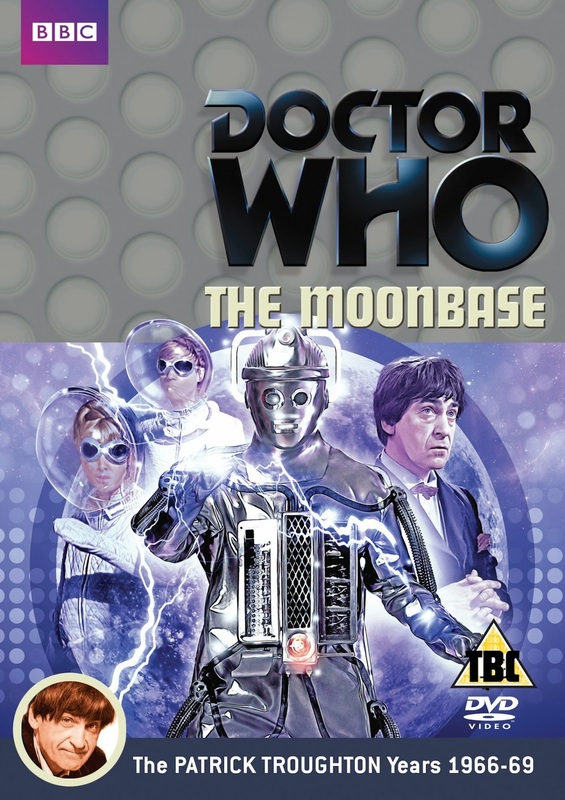 The Moonbase, a classic episode from the Troughten era however unfortunately episodes 1 and 3 are missing. But much like previous episodes they have been revived with the power of animation. So get your bow tie on and your space helmet ready because we are going to the moon! Just one thing, DON'T PUT SUGAR IN YOUR COFFEE! Where can I start? The main plot evolves around a base on the moon that controls the earths whether. Makes sense. When the Doctor, Polly, Ben and Jamie land on the moon they find this base and enter it. But a strange disease has been killing men inside the base. The Doctor is blamed but really he is trying to help. The real cause for the disease is a fleet of cybermen! Yes, their last appearance was in 'The Tenth Planet' (I reviewed that!) but now they have been redesigned for a more scary look! Talking about looks, lets look at the cover for this DVD: It is the basic classic design with roundels and logo. The picture itself is absolutely stunning! Spacemen, the doctor and a cyberman are standing. Electricity from the Cyberman is shooting to the reader. Mixes of blues and purples in this cover which really sets off the spacey feel. This is by far my favourite cover for any DVD. Just Fab. Getting back to the Cybermen, nice! I love their redesign. It is far more scary and threatening. The actors must have been so relieved to wear something so much better and easier. This is probably my favourite Cyberman design with Earth shock/Silver Nemesis being a close second. The cybermen are the classic monsters and I think they are way better than the daleks! A formidable foe. The Ice Warriors for me are the iconic Troughten villain but the cybermen are definitely iconic and outstanding! Also, their mechanical voices are scary which I like. To wake up and hear that, I would be terrified!!! Too bad they don't tolerate nail varnish. As you can see, the cybermen walking on the moon is a lite scene but the animation is phenomenal. I absolutely love the animation, it is inspiring and visually stunning. If I ever meet the person who did this I am going to give them a high five and a big box of chocolates. (: Seriously though guys, whether you are a 2nd doctor fan or not, just get it. The animation is the diamond of this already pure gold episode. Well done! Before I wrap up, I'm going to talk about the special features of this episode. I really enjoyed 'Lunar Landing'. It was fab. I found it interesting how they created the episode. And to see it through the eyes of the actors is just brilliant. Overall a great DVD with great special features and animated missing episodes. A must have for any whovian! Overall this episode gets 19/20-MUST WATCH!!! 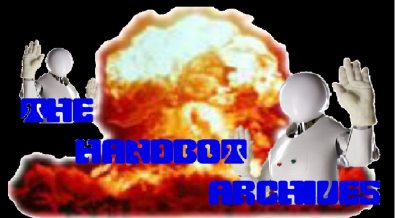 Before I do this, am I a good Handbot? Only joking! Today in this review I will discuss the latest episode in series 8! Into the Dalek! EXTERMINATE!!!! There is so much to talk about! Lets start with the story/plot. It is really intriguing! The idea of going inside your worst enemy, to see all there secrets and mysteries. The doctor has been fighting the daleks for over 50 years, you can't have one without the other. This made for an excellent, gripping story. Almost a base under siege story, but different. The doctor in this episode was slightly different to how I saw him in Deep Breath. He is now the doctor and has settled into the role. But he is still unsure, like when he asks Clara if he is a good man. And neither of them know. But I like Peter Capaldi's doctor. His debut series has been met with criticism. The Lizard Lesbian kiss controversy and complaints that his first episode deep breath was violent and gruesome. For me, all of this is fallafal. The lesbian kiss is nothing you wouldn't see in real life! What is this? But before I steer of subject. Lets talk about new character, Danny Pink. He will be the new recurring character and Clara's boyfriend. Does this ring a bell? Mickey at all? I was really worried that he would be just another Mickey, I don't want another mickey, I only need one mickey to be happy. But instead of mickey we get a character with alt of development. He is an ex solider. I really started to feel for him when the boy asks if he has killed anyone, but when he asks if he has killed anyone who wasn't a solider he starts to well up. I also love how he reacts to Clara, you know the story. Boy meets girl, girl meets boy. Boy gets anxious, girl stays calm. I really like Danny. I think he will be a great companion. But will the doctor accept him into the Tardis Crew? The writing of this episode has been done a bit differently. This time, Phil Ford and the Moff wrote the episode! I love this because it is a combination of different fabulous minds. The writing, directing and visual effects were superb. The dinosaur in 'Deep Breath' was just astonishing and different space scenes in this episode were visually fantastic. 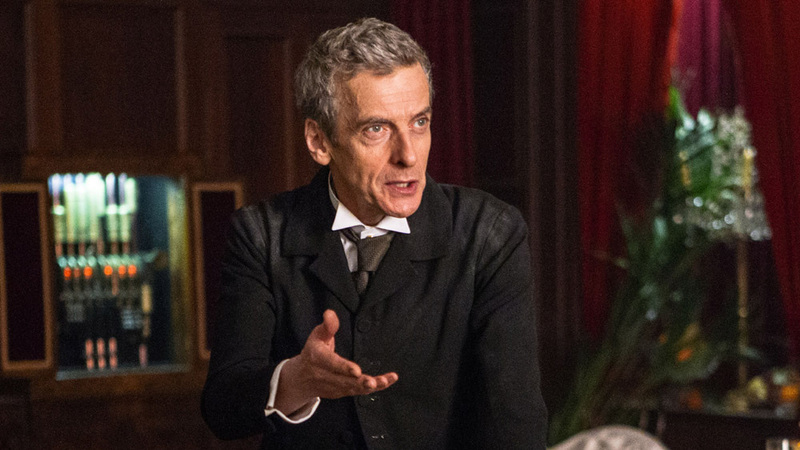 I really loved the directing of Deep Breath and this one as well. It is very cinematic. Also, how can I forget that expert soundtrack. The themes are really amazing and very hanz zimmer, as I said before. CINEMATIC! But my favourite feature of this episode was the sets. I really loved them. Such expertly crafted. AMAZING! Good job! So overall what did I think, amazing. This episode was just fab. A really good concept and ideas. I really just wished it could have been longer! If each episode of DW was Deep Breath length I would love it. Despite that, everything about this episode deserves a high five. Well done BBC! If episodes are going to be this good, season 8 will be a hell of a rocket ride! A fantastic episode, really enjoyable. You better watch it right now! Remember you can catch it on iPlayer along with Doctor Who extra! A fabulous look about the making of the episode! Bye for now Handbot Fans! I loved how this film was set out. We had news clips every now and then called 'The Novak Element'. They were fab. We start learning how future Earth is being protected by robots made by a company called omnicorp. Americans are not allowing Robots in America though. Omnicorp have to create a something that knows what it is like to be human. They begin to create the idea of Robocop. We meet Alex Murphy, he is cool. That is all I can say really. We didn't get enough human character development. He just seemed a little boring, although I did sense that he was a little bit of a Sherlock Holmes. He comes home one night where he puts his son to bed. He and Clara Murphy have a little one on one time (you will understand what I mean if you see it) but get interrupted by the car which has the alarm going off. Alex goes outside to turn it off but some gang members hid a bomb inside which explodes and terribly injures him. Omnicorp save him by turning him into Robocop! Seriously though, it took ages to get to this part. I found it odd that from this moment on, he was only called Robocop once. He was still called Alex. Which is odd given that the title of this film is Robocop. A lot of time is wasted for a while on. Did anyone else find it Racist that the leader of Omnicorp says: "We need to make him look tactical, let's go with black". He didn't need to say that. It isn't long until we see him in action. These battle scenes are really cool. Before they release him into the world, he has an emotional breakdown so they remove all his emotions (cybermen mention). Some explosions later he begins solving his own murder, kills his murderers and drives a flashy bike. For some reason whilst trying to arrest the leader of omnicorp he battles a ED-209. For no reason. What did it ever do to you? His arm gets trapped under an ED so he blows it off. He shoots the leader of Omnicorp with half an arm, a smashed head piece, burnt legs and a bullet cover chest. God sakes. I bet if he didn't try to kill ED he wouldn't be so smashed up. At the end of the film he gets renewed back into silver armour. Then, my absolute highlight. We have another Novak Element. Of course, in the movie there is a lot of swearing. But at the end he swears loads but it beeps because it is a news show. I don't why I found that funny, it just was. This film gets a 8/10! I would recommend to see it! This is a review of the ice warriors. A classic episode starring Patrick Troughten as the doctor. It introduced the spine tingling ice warriors, ferocious martians looking for a new home. But the true story behind this lizard like monsters was a blue peter competition way way back in the day. It was to create a new monster to fight the doctor. The winners entry created this memorable enemy that still sends shivers down our backs today. So where do I begin? When the doctor meets the scientists they very soon find a 'viking'. But things aren't as they seem. It is in fact a ice warrior! This is very good. They find out that they have led the enemy inside their most safe position. This is much too typical for an Ice warrior story but it sets things out quite nicely. 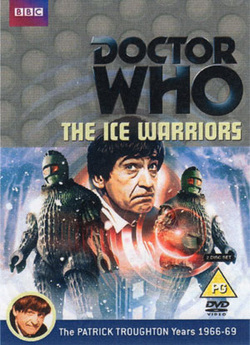 The doctor and the head scientist stay at the base whilst Jamie and another scientist go looking for Victoria who has been captured by the ice warrior to help him bring back a whole army of ice warriors. We see hundreds of the shadowy figures inside the ice. This is a very good way to 'haunt' people. You dont want them to look whats inside. You get that urge not to but you just want to keep looking to see the entire army in action. And that army grew larger and larger. Eventually we had a few of the ice warriors in one room. These scenes would have looked great. Such a shame they were lost and replaced with animation. Which leads me onto my next topic. The animation! The animation is superb. Fantisimo, tre bien! It is some of the greatest i have seen in a long time. To be honest, i'm a bit of an animator myself but never really got head into it like this. It was only ever short scenes with lego people or character building doctors. I do my fair bit of computer animating but only when i'm bored. I must say, it is fun and helps pass the timey-wimey. These people are very dedicated to what they do. The detail is amazing. Just look. Its art. The animation just wins it all over for me. I want to see more animated episodes in the future. Perhaps for more doctors other than Patrick Troughten and William Hartnell. That would be amazing. I might just sit in another room and cry for another hour or so. Yes here it is. Although this is a fairly late and Christmas was like a couple of days ago i still want to review this episode. It was Matt Smith's regeneration story. And what a bomber. This is one episode i will never forget. Matt was my favorite doctor so for most other people this one meant alot. It was undeniably epic. The plot line was great and fitted in with Matt's doctor perfectly. A town called Christmas is under siege and the doctor is determined to protect it, no matter what the outcome. It is very sad but in a way happy as well. We see the doctor eventually grow older over time. It makes you want to burst out into tears, although he seems perfectly fine with this and he never wants to stop guarding the planet known as Trenzalore. And he know he cant. He saw his future. He saw where he was buried. But it is so emotional how he knows he cant leave, but it is that he doesn't want to leave. Near the end we see the doctor and old man who practically looks like William Hartnell. He has one last meeting with the heart broken Clara where they pop a cracker and read out a poem. An emotional scene that will be hard to forget. The doctor goes up to face the Daleks who are trying to kill him but amazingly the time lords give him an extra set of regenerations. This solves the regeneration mystery quite fittingly. Before regenerating out of old age, the doctor goes into his tardis where he has the company of Clara and a mystery ghost of his past. Of course it had to be her. Amy Pond returned for one last scene to comfort him as he changed. In that instant, eleven became twelve. The clock reset itself. The only bad thing about the regeneration is that it was over really quickly. Where was the anticipation of the long wave of energy. Are the BBC not doing the transition of one doctor to another. We usually saw their faces merge into another but now its just done in a few takes. I know your tactics BBC! Overall this episode gets 20/20-MUST WATCH!! !